For 54 years Switzerland has acted as a mediator between Washington and Havana, representing the interests of each of the two countries before the other. The restoration of diplomatic relations between Cuba and the United States, the official reopening of respective embassies on July 20, has put an end to the commission that the European country formally accepted in 1961, when US President Dwight Eisenhower broke ties with the island. Switzerland did not simply assume the bureaucratic tasks, according to historians who have begun to analyze the file, and who highlight the crucial role played in times of extreme stress, such as the missile crisis. Documents kept in Swiss archives reveal that the Cuban government tried to nationalize the headquarters building of the US representation in Havana in 1964 to turn it into the Ministry of Fisheries. The Swiss ambassador in Cuba, Emil Stadelhofer, persuaded the government of Fidel Castro to abandon the plan. The diplomat had to intervene personally on several occasions, as on February 2 of that year, when the US Coast Guard stopped four Cuban fishing boats and Havana responded by cutting the water supply to the American naval base at Guantanamo. “Stadelhofer drew a red line,” says the current Swiss ambassador to the US, Martin Dahinden, in remarks Monday on the website of the magazine Foreign Policy. “If he had not been in the right place at the right time, things would have been different,” he says. When President Eisenhower first asked Switzerland to represent the United States to Cuba, in 1960, it was a complete surprise to the European country, as revealed by historical documents, “mainly due to the size of its diplomatic mission, very small compared to delegations such as the United Kingdom.” However, its experience as a powerful protectorate of foreign governments prevailed, dating back to 1870, during the Franco-Prussian War. After accepting the job, Switzerland sent a team of nine people to the island to replace the 60 members of the US diplomatic corps. 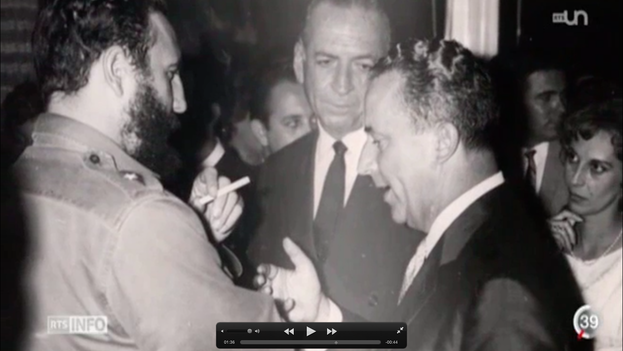 Ambassador Stadelhofer, according to the files, maintained a close personal relationship with President Fidel Castro and could access him at any time. It was the Swiss ambassador who managed to get Cuba to authorize US planes to fly over the island after the missile crisis of 1962. Stadelhofer was also responsible for facilitating the movement of refugees from the island to the US in September 1965, when thousands of Cubans jumped into the sea on rickety boats after Havana allowed “all those who wished” to leave the country. In 1977, Washington and Havana agreed to the opening of a United States Interests Section in Cuba. Even after the return of part of the US diplomatic staff to the island, the Swiss flag continued to wave outside the building, until July 20. The Secretary of State of the United States, John Kerry, has invited the head of the Federal Department of Foreign Affairs of Switzerland, Didier Burkhalter, to the official opening of the US Embassy in Havana that will take place on August 14. Switzerland is currently in charge of representing the United States in Iran, Georgia in Russia, Russia in Georgia, and Iran in Egypt.